Are you an aspiring Reporter with a great story to tell? Would you like to share your amazing pictures?. This is your chance to take your story to a global audience with Emirates247.com. Report on anything interesting that has happened in your neighbourhood. Report on serious issues facing your community. Be the voice of the neighbourhood. Highlight problems and ask the authorities for solutions. Report a traffic jam. Send pictures or video clips of an accident or a fire or anything interesting and unusual. 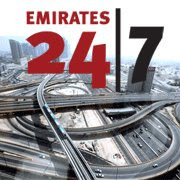 Emirates 24|7 is your platform to publish instantaneously your story, pictures and video clips. As an incentive Emirates 24|7 will also give you a chance to win up to AED20,000 a week! Email your story to response@emirates247.com or call at 0097150 1070404 for further details.